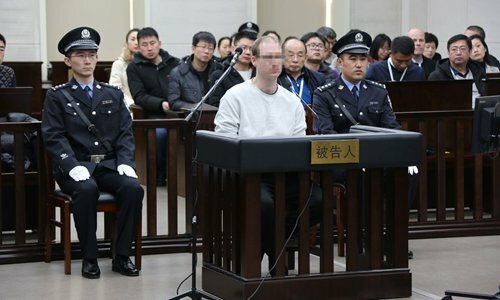 Canadian drug smuggler Robert Lloyd Schellenberg's death penalty enjoys broad support from the Chinese public and legal experts insist that the sentence is appropriate and does not violate the principle of no additional punishment on appeal. Schellenberg was sentenced to death by the Intermediate People's Court of Dalian, Northeast China's Liaoning Province at Monday's retrial, 16 days after the Liaoning Provincial High People's Court sent back the case. During Monday's retrial, prosecutors presented new evidence which showed that Schellenberg not only was the prime culprit of drug smuggling but was also engaged in organized international drug trafficking. Based on that, the court announced that the verdict does not violate the country's principle of no additional punishment on appeal. Some people said mercy to drug dealers equals infringement on the rights of millions of Chinese people. "We should safeguard the dignity of our law and support the decree of justice and not be afraid of any pressure," wrote one Sina Weibo user. Schellenberg's attorney Zhang Dongshuo told the Global Times on Tuesday that the defendant decided to appeal. According to China's Criminal Procedure Law, if the defendant filed an appeal and the second-instance court sent it back for retrial, the court of the original trial may not aggravate the defendant's penalty unless the prosecutors provide new evidence. The court also said in terms of the nature, plots and harm to society of Schellenberg's crimes, the death penalty does not violate the principle. Pei stressed that the death penalty verdict is legal and appropriate, reflecting the determination and intensity of China's severe crackdown on drugs. According to Pei, Schellenberger has the right to appeal. If the second-instance court upholds the original judgment, the death penalty must be reported to the Supreme People's Court for review. The Supreme People's Court will conduct a comprehensive review of the case and decide whether to approve the death penalty. This also reflects China's policy of retaining the death penalty and strictly controlling and carefully applying the death penalty, he said. A court official from the Intermediate People's Court of Dalian told the Beijing-based Legal Daily newspaper on Tuesday that the retrial conforms to legal procedures. Prosecutors submitted the supplementary indictment on January 2 and the court sent a copy to Schellenberg's lawyer the same day, the official said. Canadian Prime Minister Justin Trudeau has accused China of "arbitrarily" applying the death sentence on the Canadian's case. Foreign Ministry spokesperson Hua Chunying slammed such remarks as lacking the spirit of the rule of law. "Drug crimes are considered globally as serious crimes. All countries have severely cracked down on drug crimes, and so does China. Everyone is equal before the law and this is the spirit of the rule of law," Hua told Tuesday's routine press briefing. "We express our strong dissatisfaction. We urge the Canadian side to respect the rule of law, respect China's judicial sovereignty and stop publishing irresponsible remarks," she said. 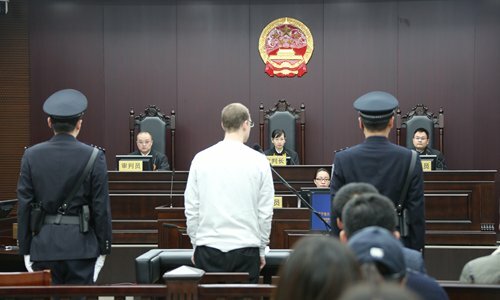 Chinese analysts stressed that the large amount of meth smuggled is the reason for Schellenberg's death penalty and China holds zero tolerance toward this and will strive to fight anyone - foreigner or Chinese - involved in drug-related activities. According to China's law, one could be sentenced to death for smuggling over 50 grams of meth. Chinese authorities cracked down on 1,481 relevant crimes and 1,876 foreign suspects were arrested for drug activities in China in 2016 alone, China's National Narcotic Control Commission revealed in 2017. CNN reported on Tuesday that in the past, Westerners often enjoyed lighter sentences for such crimes - and better treatment in detention - to ease diplomatic relations and avoid international criticism. But as China's economic and political influence grows, the age of leniency for Westerners just might have expired. "Many foreign nationals awaiting execution come from countries with good relations with Beijing, demonstrating that - outside the West - China makes no exceptions for drug offenders, whatever the diplomatic cost," said CNN.